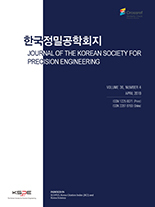 김호상, 이동찬, 이경돈, 김영수,(2014).대형 망원경용 FSM(Fast Steering Secondary Mirror)을 위한 팁틸트 액츄에이터의 성능평가.한국정밀공학회지,31(5),403-409. For ground-based telescope application, the performance assessment of tip-tilt actuator is important because the optical quality of telescope depends upon the windshake compensation ability of the fast steering secondary mirror. But it is difficult to measure the performance characteristics of the actuators due to the large size mirror and test facilities including the vacuum support and structural frame. In this paper, the full-scale tip-tilt test bed for the large size secondary mirror with diameter of 1m is built and the several tests are performed including the range, resolution and frequency response function. From the measurement results, it is shown that the tip-tilt actuator can successfully compensate the windshake with frequency of maximum 12 Hz and be a candidate for the Giant Magellan Telescope.